King Philip II. Carta de Hidalgua. 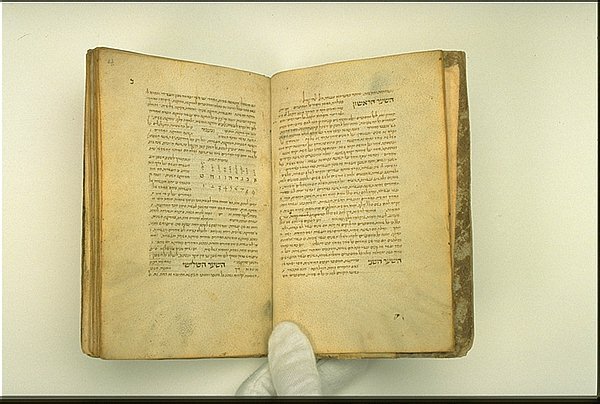 Hebrew manuscript on vellum. 15th century. The surface of fine vellum was particularly well suited for receiving intricate pen strokes and painted illumination. It was also a hardy material that withstood heavy use. The two manuscripts shown here--a fifteenth-century Hebrew mathematical text and a sixteenth-century Spanish royal document--demonstrate the qualities of vellum that made it the preferred surface for manuscript production. The vellum allows the fine strokes of the Hebrew text to remain legible. 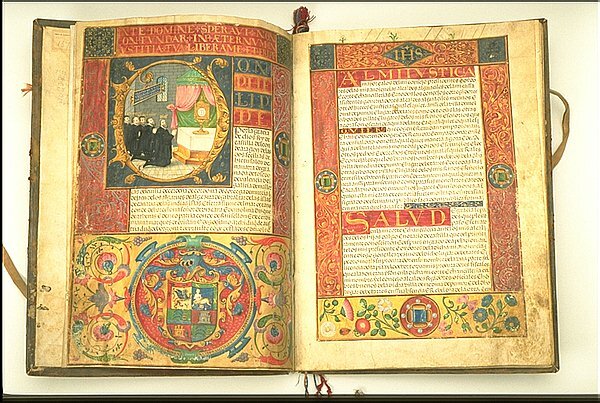 In the Carta de Hidalgua issued by Philip II in 1563, the pages accommodate the lavish illumination done in the Flemish style. The document, which grants the status of nobility to Diego Gonlez, portrays five members of the Gonlez family, clad in black, kneeling before a monstrance placed on a canopied altar.